This post was originally written in November 2013, describing the well as it was found at the time. 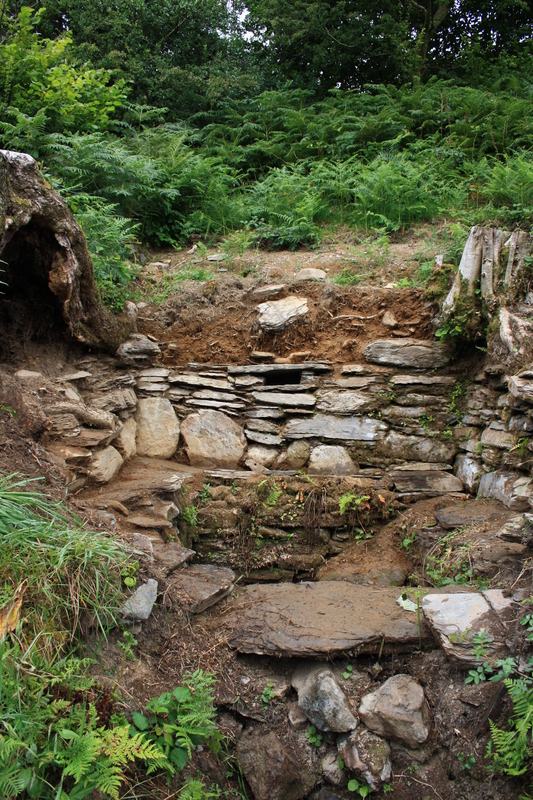 In June 2014 the vegetation surrounding the well was cleared and an excavation started to investigate the well and the surrounding hillside. 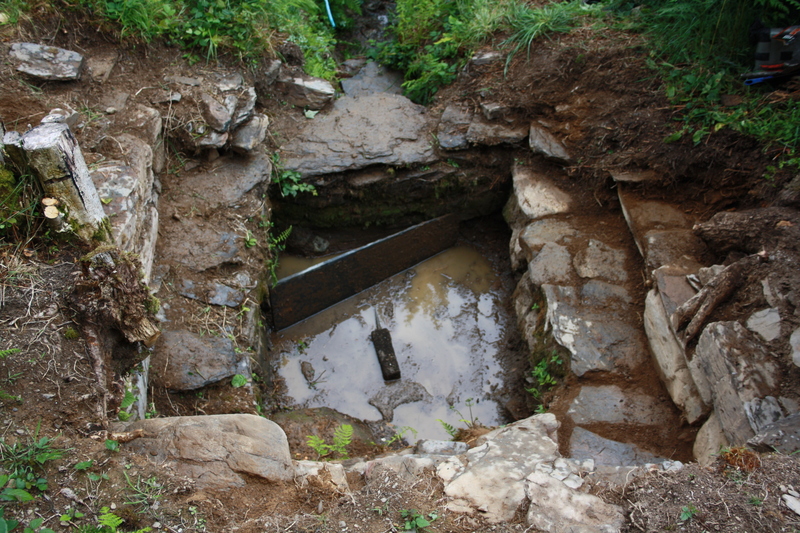 This article has now been updated with additional pictures taken in August 2014 which show progress in the excavation and reveal the structure of the well. The name of Elen, or Helen, appears frequently in this part of the world. 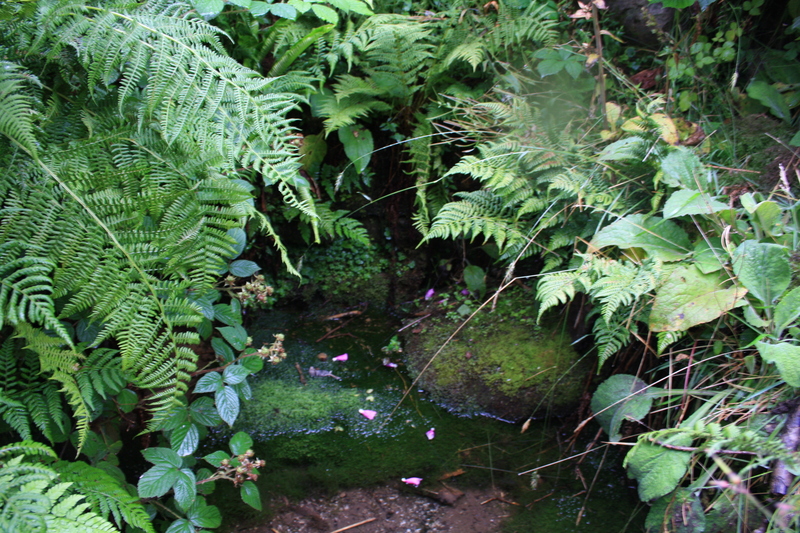 There is a well, Ffynnon Helen, up the road near Caernarfon; an old long distance Roman road which passes through the area carries the name Sarn Helen, in the belief that she commissioned its building. 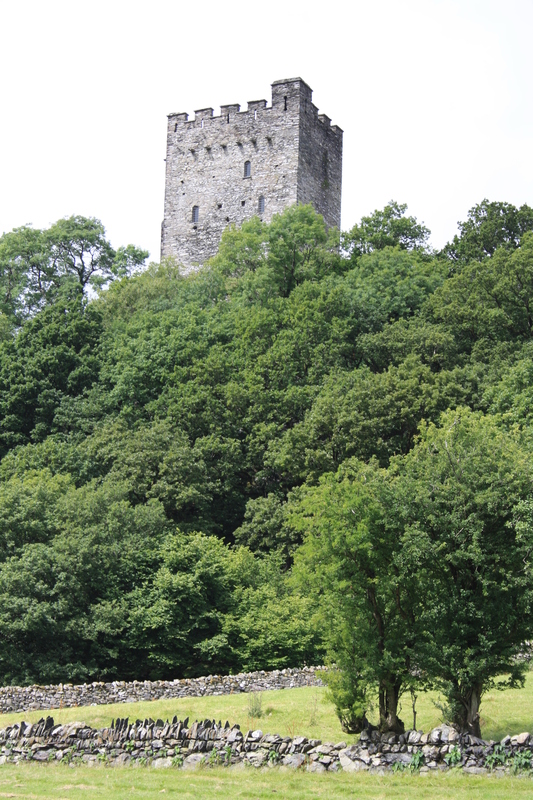 Dolwyddelan lies on the A470 south west of Betws y Coed, under the shadow of its impressive Welsh castle.There was a belief that the name Dolwyddelan itself was derived from Dolydd Elen – Elen’s Meadow. The village more likely owes its name to St Gwyddelan, the Irish associate of Beuno who we met previously at Gwyddelwern and to whom the church here is dedicated. His original chapel was set up on the nearby hillside of Bryn y Bedd in around 600AD. 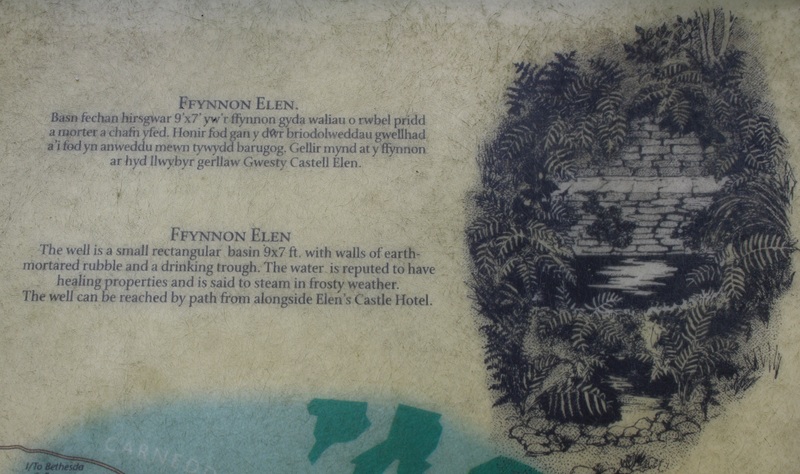 Despite this, the connections with Helen continue to run deep, a Methodist chapel first established in 1783 bears the name Capel Elen and the hotel beside the well is called Castell Elen. But is the well Ffynnon Elen or is it Ffynnon Elan? The historical record prefers the former. Francis Jones  and the Gruffydds  both use Elan and both give an alternative dedication to Gwyddelan himself, citing Myrddin Fardd. For no other reason than choosing to follow the larger crowd we have used Elen for now, though we are obviously open to offers to change. 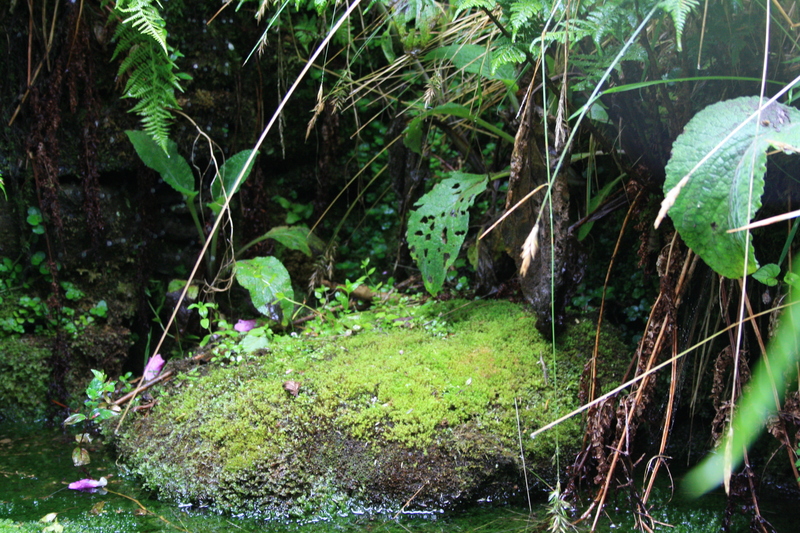 In recent years the well here has suffered various attacks of nature. Trees growing close to the site were observed some 20 or 30 years ago to be spreading their roots into the well structure, displacing stones and leading to landslips around the well. Recently the most invasive of these trees have been removed to protect and stabilise the well; however problems with access means that the site is difficult to visit and maintain. I asked a passer by near the church whether he knew of the well and for directions to it. He immediately directed me to a small, stepped, pathway leading off the main road through the village between the hotel and the next door chapel. This path leads directly up to the well which lies some 50 yards up a steep hill beside the road. As I understand it though, the owners of the land across which the path runs have forbidden its use, it is not marked as a right of way, and although this path appears to have as its sole purpose giving access to the well, indeed North and Hughes state (in 1924) that this path is the access to the well , today the primary access is supposedly through the gardens of the hotel. 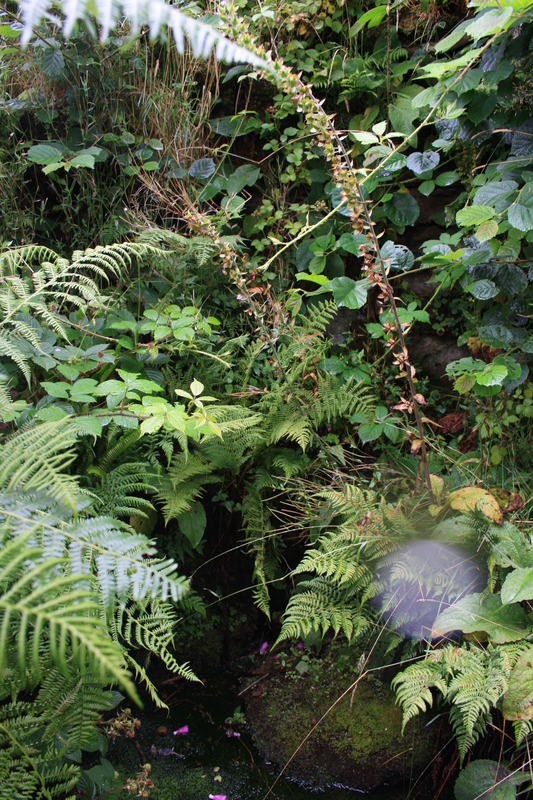 As a result rescue work on the well has been hampered and the site is, during my visit at least, almost totally buried beneath undergrowth and ferns. Beneath all of this it was just possible to make out the remaining stonework and structure, and to note that water still flows into the well, possibly being directed away through blue plastic pipes which cross the site. Ffynnon Elen has a long history. Legend has it that Roman soldiers used it as a picnicking site, and possible Roman coins have been found close to the well in excavations. Excavation has also shown evidence of a road close to the well suggesting that the road through the village at one time ran much closer to the well. At some period in its history, the well was surrounded by a small stone basin, itself in a rough stone built well house, some nine feet by eight and a half. A narrow pathway ran around the well within the building. A sketch on the information board in the car park for Dolwyddelan Castle shows the shape of the remains of the well in better days. It is to be hoped that access arrangements can be agreed for the well. Apparently grants have been secured to restore the well and to provide interpretation for the site. 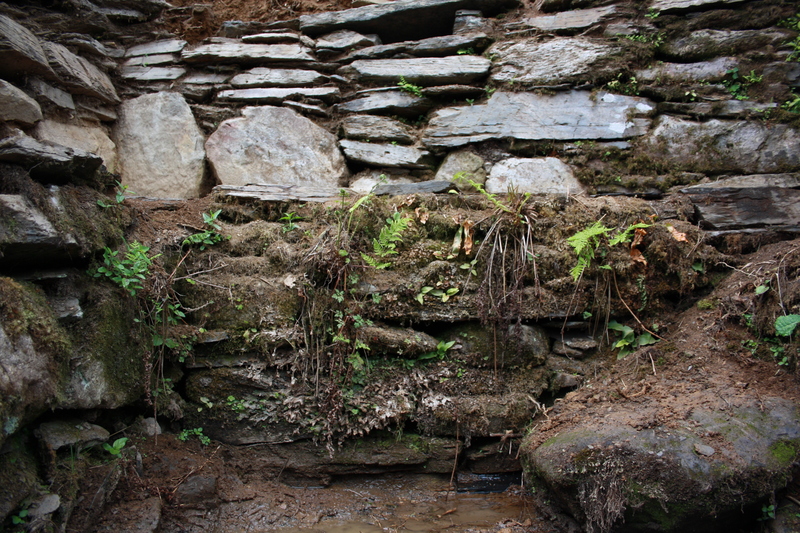 Much remains of the basic structure, and water does seem to flow. It would be a great pity if such a monument were to be lost for such a trivial reason. Public access issues remain to be resolved. thank you – I hope you do write about Elen at some stage, she does seem to be popular in Cheshire, Lancashire, Cumbria and up into Scotland too. The G Jones paper is interesting on the subject, even if it does concentrate on Wales. Great post. Sadly, landowners can be a problem, at least they haven’t desecrated this as in some places. Lets hope that it gets rectified, it sounds a fascinating site. As regards Helen/Ellen etc, there’s a whole can of worms, I found two fascinating a little known ones, its not in James work in Lincs and surprising in Essex. Hi there – I’m Helen Hardy. My husband Adam and I own the land on which the well is found. It is very sad that we have an awkward villager who objects to the use of the path. It is believed by some that he has no ownership of the land but claims his drain runs under the pathway. We have been told that it would not be ‘neighbourly’ of us not to respect his preference for the path not to be used. If you have information to help us prove historical use of the path to help us establish a lawful right of way to access the well using the path between the hotel and the chapel, we would be infinitely grateful as it has so far taken us 7 years to get this far! We have been unable to touch the well as that would void the grant we have secured from the Heritage Lottery Fund. Next time you visit, please call in to see us (or please just call anyway as I’d love to talk to you!). Perhaps if/when you visit, you could give us a quick ring to check we are in? We really look forward to hearing from you. I realize this comment is three years old, but our family is planning a visit to Northern Ireland in August (2017), and I was hoping to make a slight detour to make a pilgrimage to the well. Is that somethng that is possible? Has anything changed with the path access? (When I became Catholic in 2014 (coincidentally), I chose St. Elen as my confirmation saint and would love any opportunity to visit a place or two associated with her. So you should have no problem visiting during your visit, if the path is blocked there is access through the hotel grounds. I hope you have a wonderful trip. 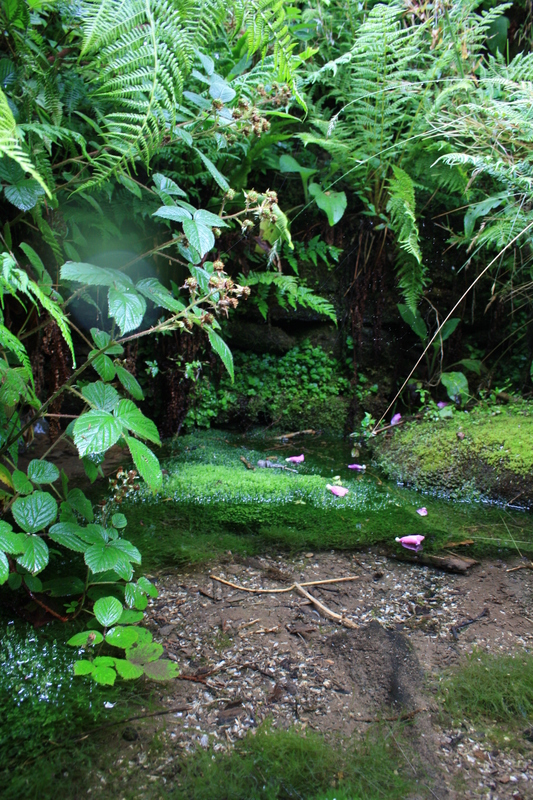 Your picture of the restored well in your link makes me want to go even more now. Trying to sort out the logistics of getting from Belfast to there as cheaply as possible.